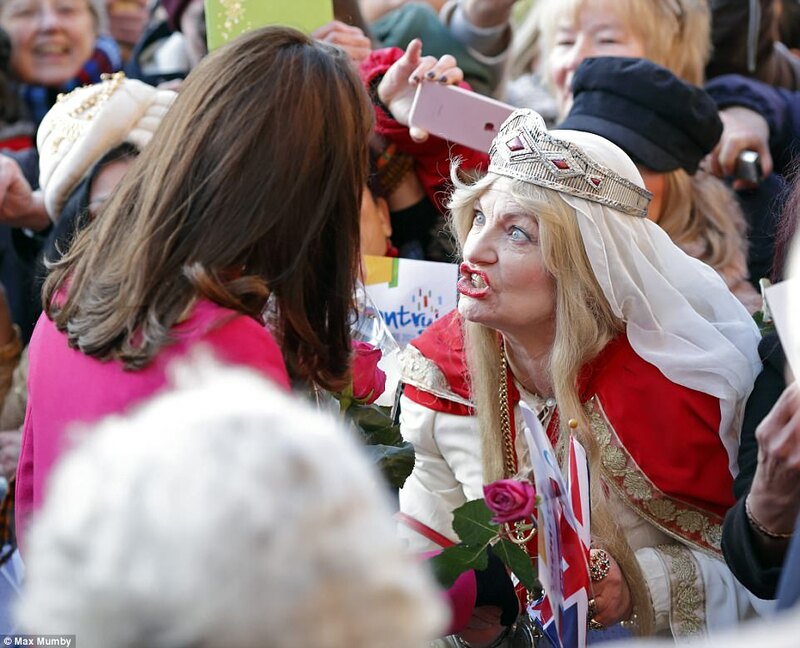 With two young children at home, she's probably well used to all the singing and dancing that goes into keeping youngsters entertained. 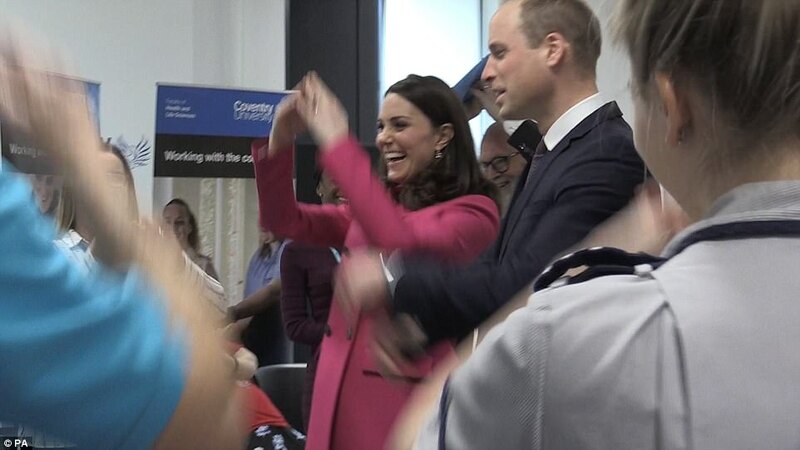 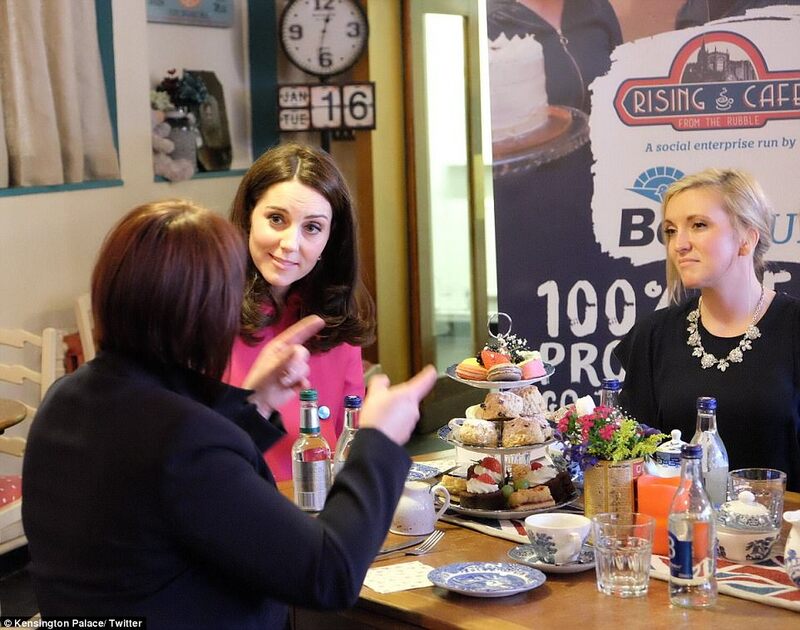 And today the Duchess of Cambridge put those skills to good use as she performed a 'wiggle' dance move during a communications training session with paramedics at Coventry University. 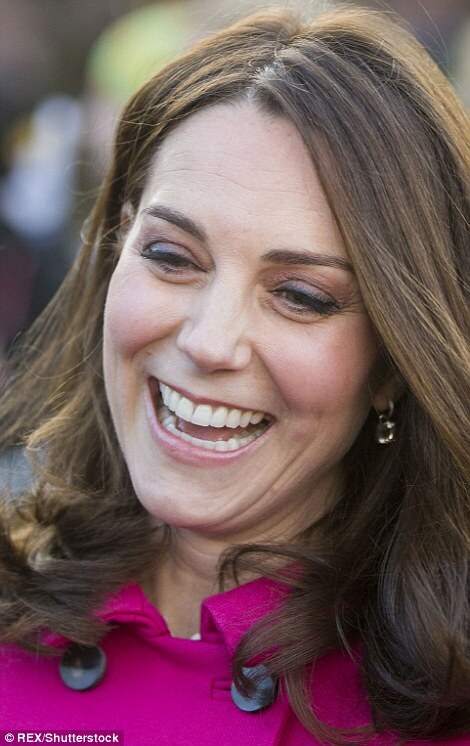 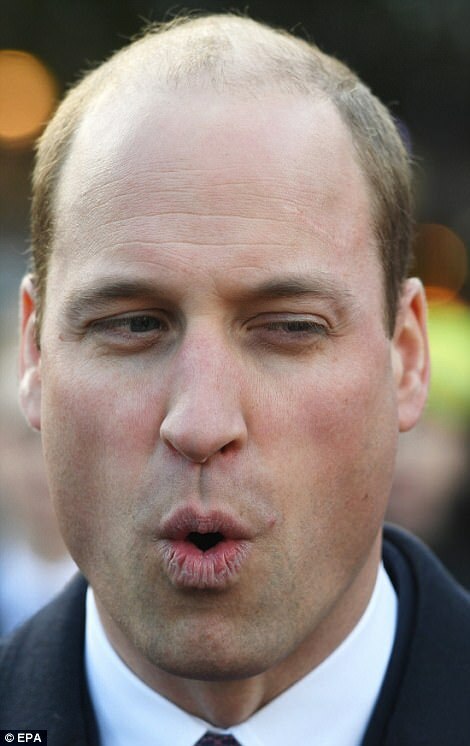 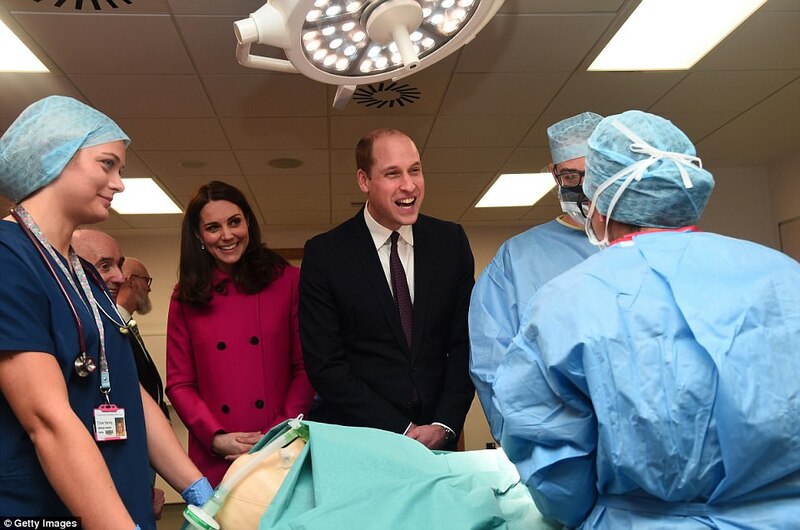 Kate, 36, who was visiting the city proved she was a good sport as she joined in with the session, although William looked a little more reluctant. 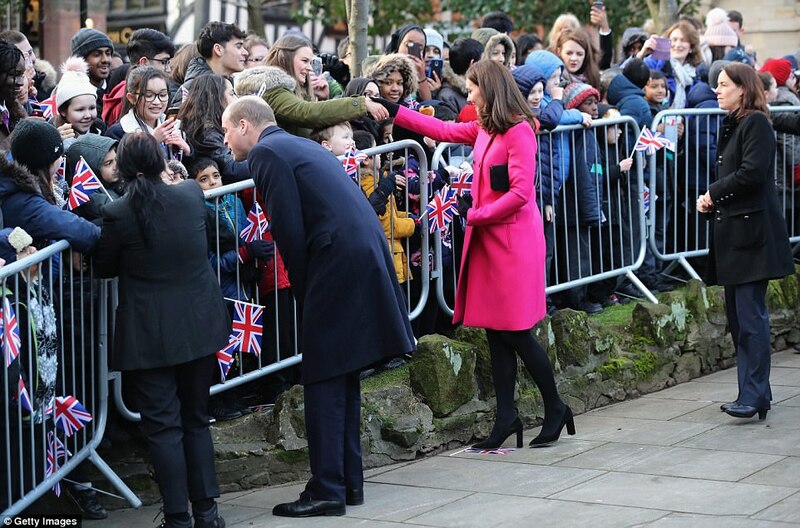 After arriving, unusually, by train this morning accompanied by a small entourage the pair arrived at their first engagement at Coventry Cathedral to cheers from hundreds of flag-waving schoolchildren. 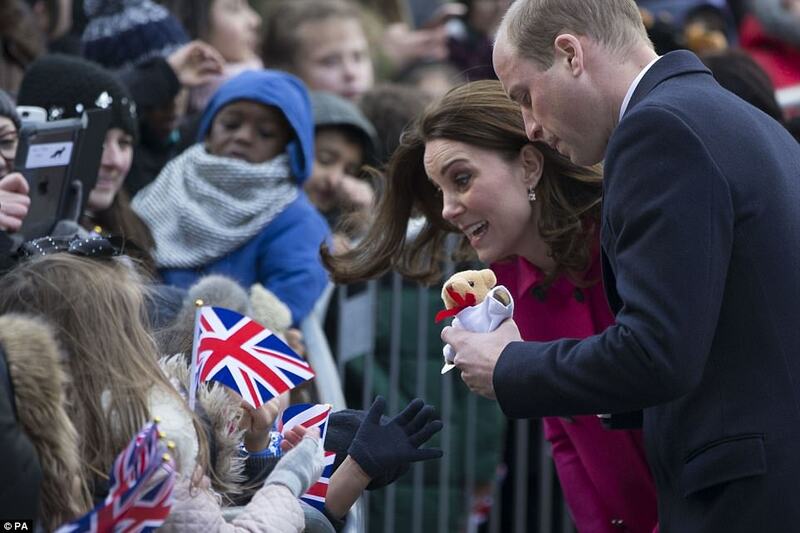 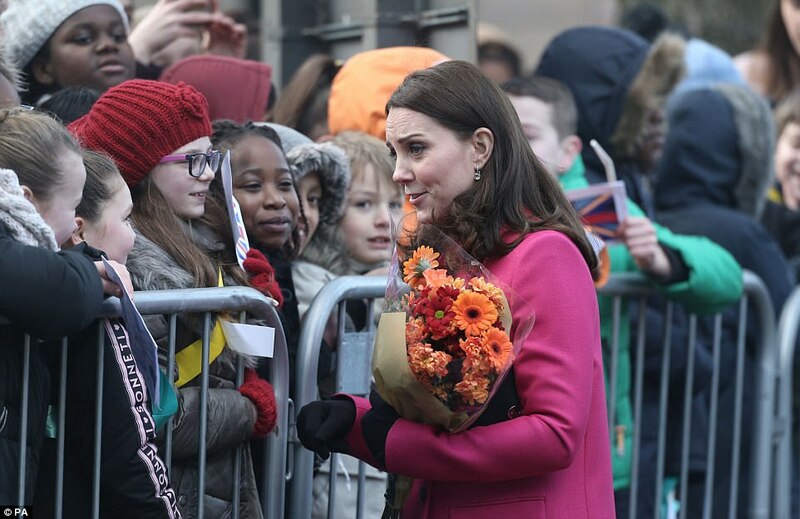 The Duchess also came to the rescue of a 10-year-old boy who felt unwell after waiting three hours in the cold to see her. 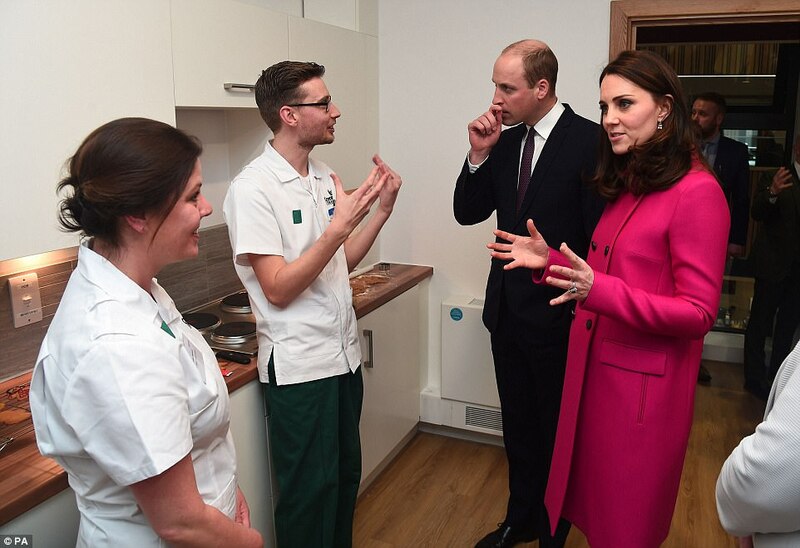 When she spotted that he was not well, she turned to one of her police protection officers for a sickbag. 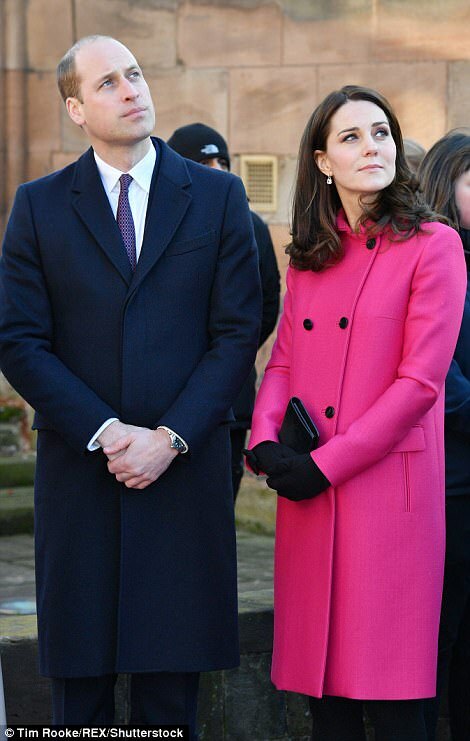 The duchess met Craig Skipper, a pupil at Corpus Christi primary school, on a walkabout outside Coventry Cathedral. 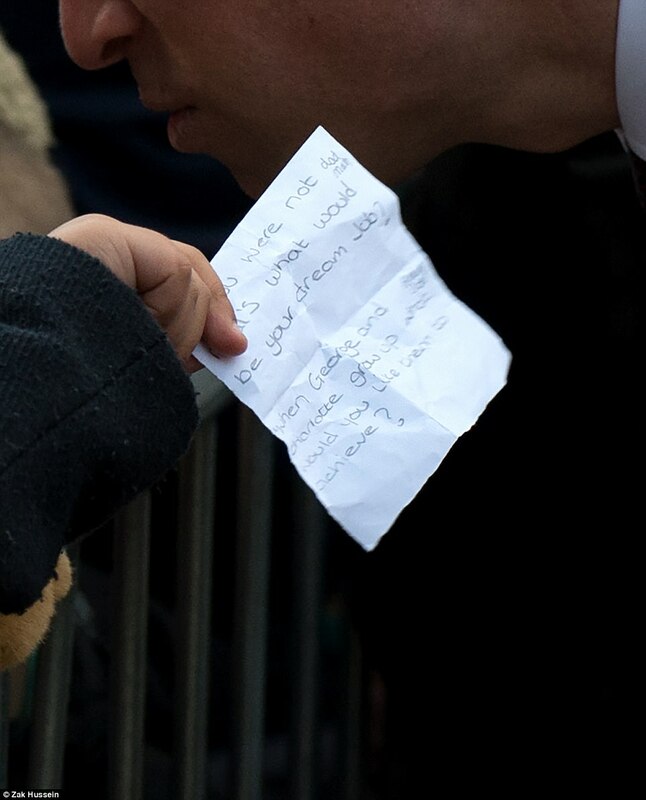 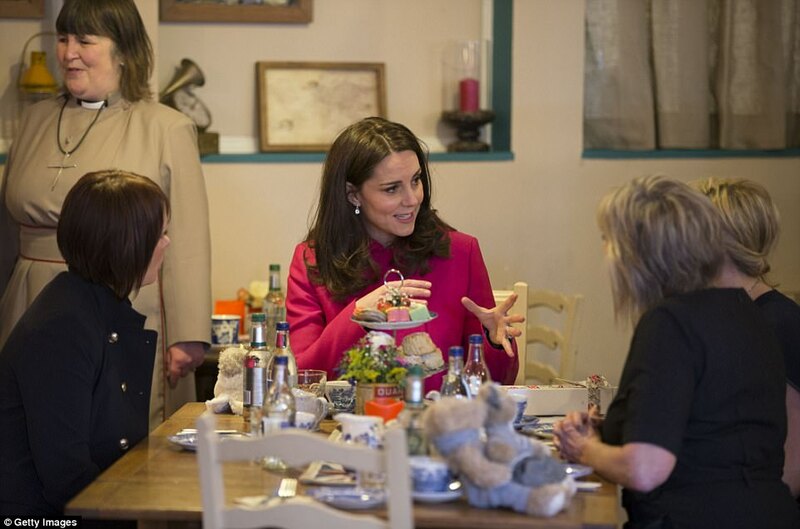 The duchess then went over to talk to one of her police bodyguards, and came back with a brown paper bag of the type used by cafes for takeaway coffee and sandwiches. 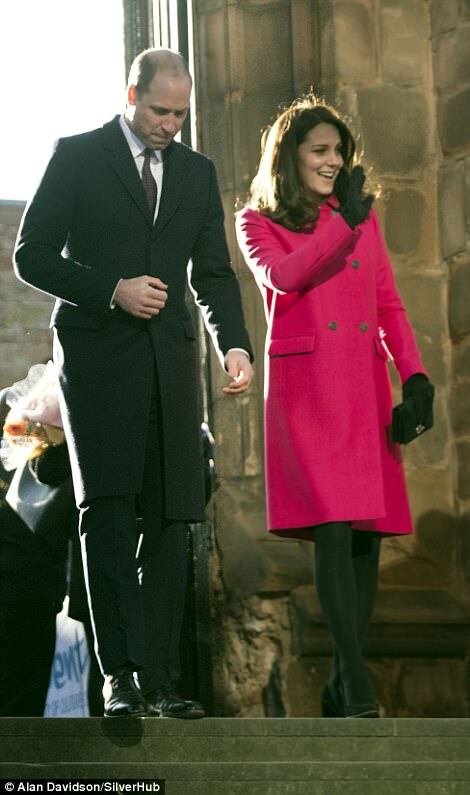 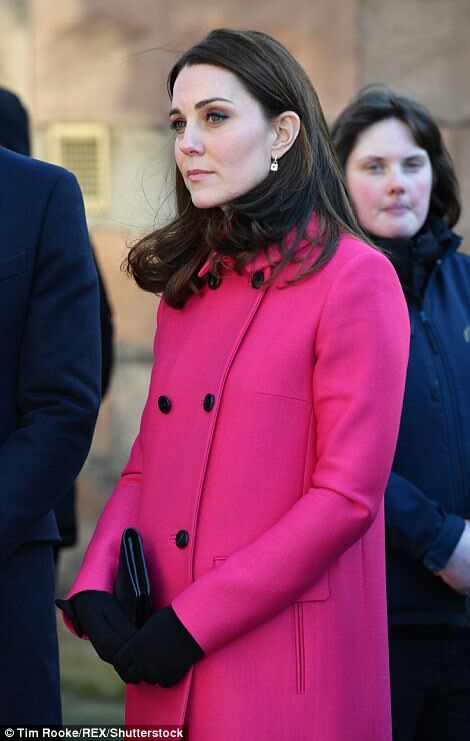 Mother-to-be Kate looked radiant this morning, steeping out in a bright pink Mulberry coat she wore twice during both her pregnancy with Princess Charlotte - on a visit to the 9/11 memorial in New York in December 2014 and at the Stephen Lawrence Centre in Deptford in March 2015, her final engagement before giving birth. 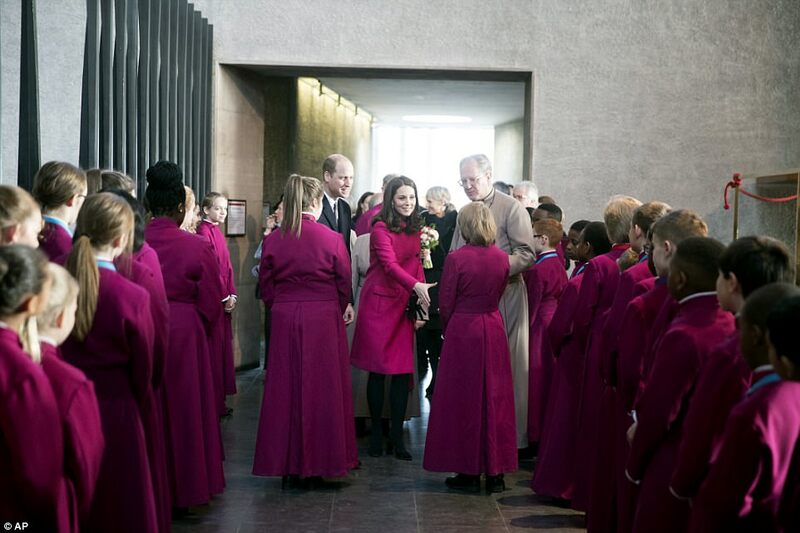 Outside the cathedral the duchess also revealed that when it comes to football, Kensington Palace is a gender equality home - as both George, four, and Charlotte, two, have got Aston Villa kits. 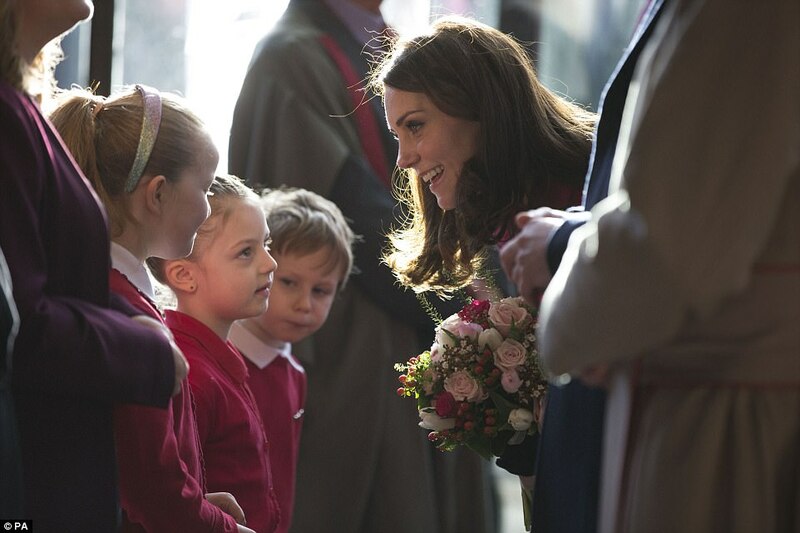 A group of schoolchildren from the local Sacred Heart School noisily welcomed the couple. 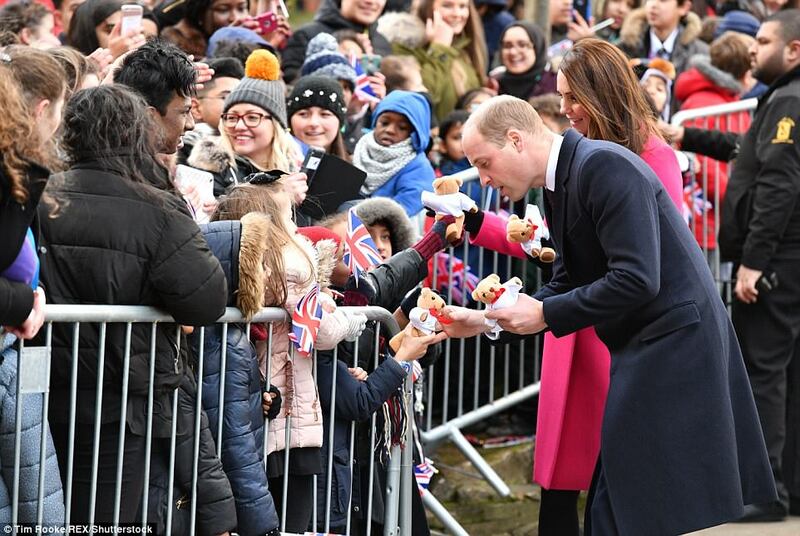 Among them, was Darcy Hayes, 9, who gave her some bright orange flowers. 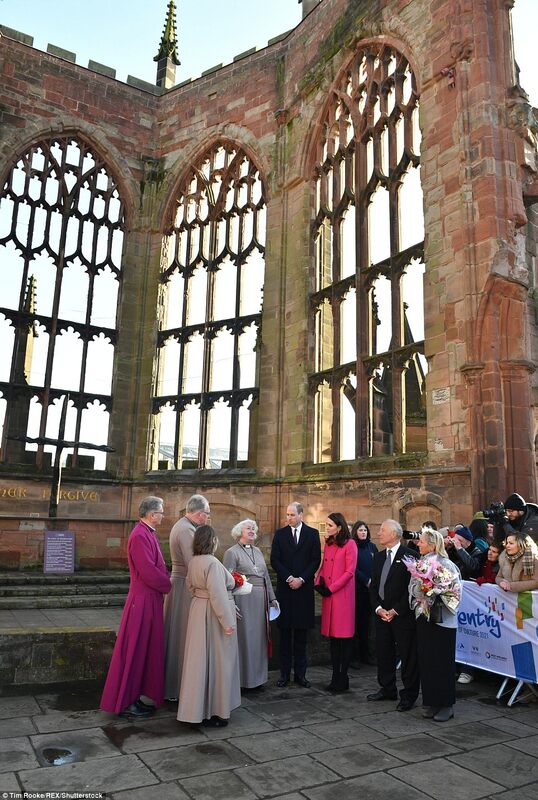 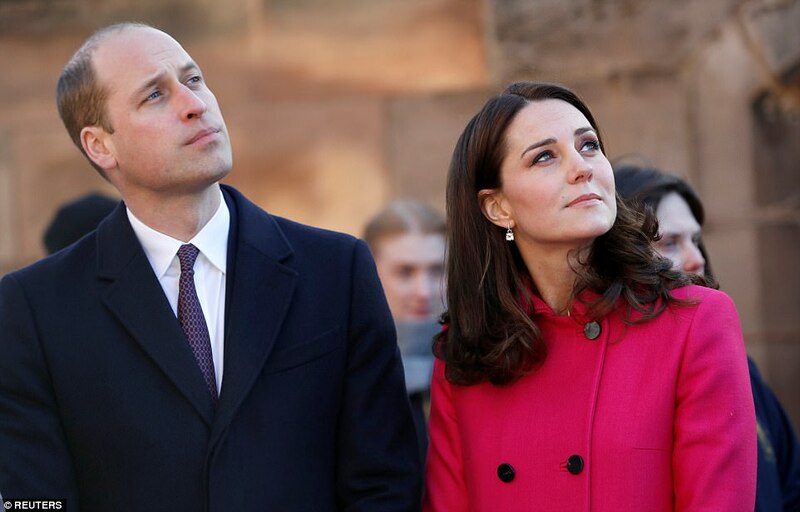 The royal couple started their day by visiting the ruins of Coventry cathedral, destroyed by Second World War bombing, but is now a symbol of hope and peace. 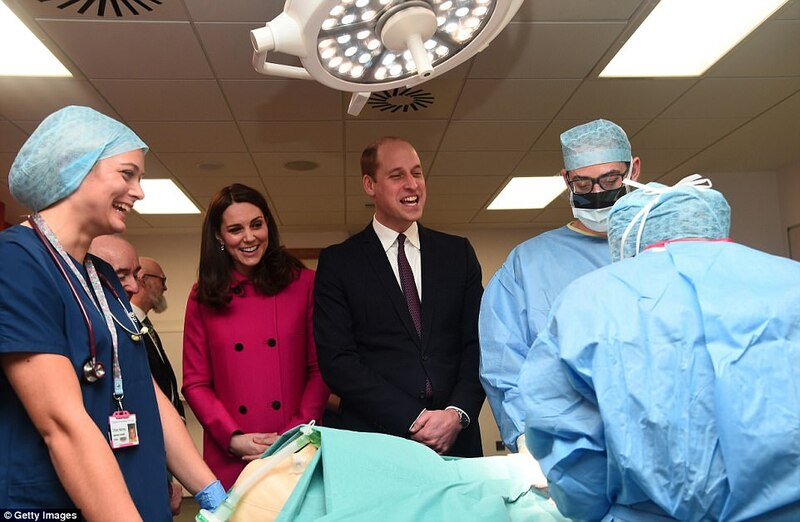 William and Kate toured the institution's new science and health building. 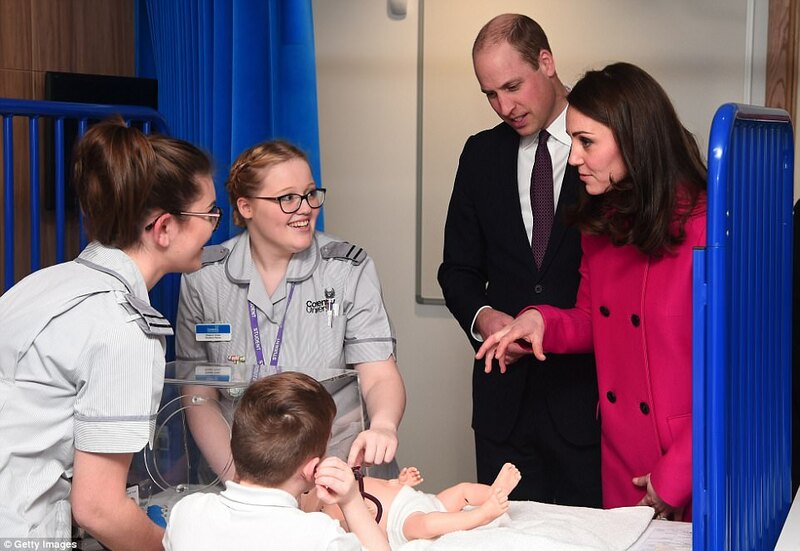 At the facility students learn to care for a patient at every stage of their medical journey, from paramedics arriving at their house to their stay in hospital, through to their rehabilitation at home. 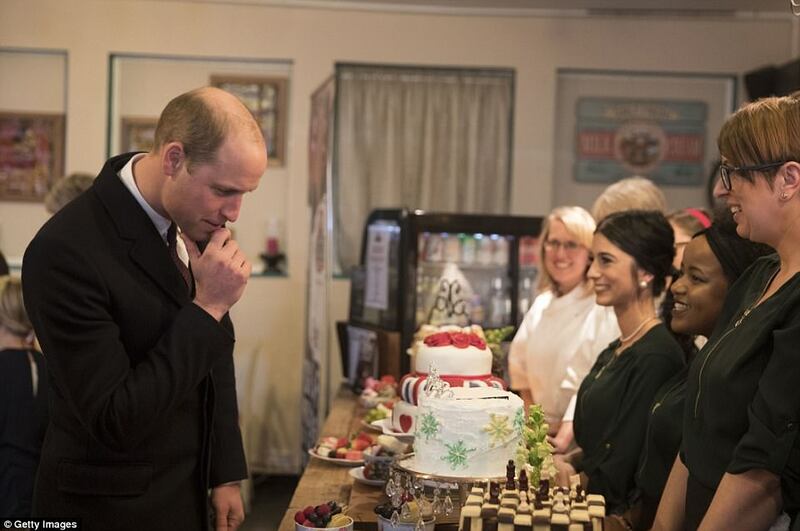 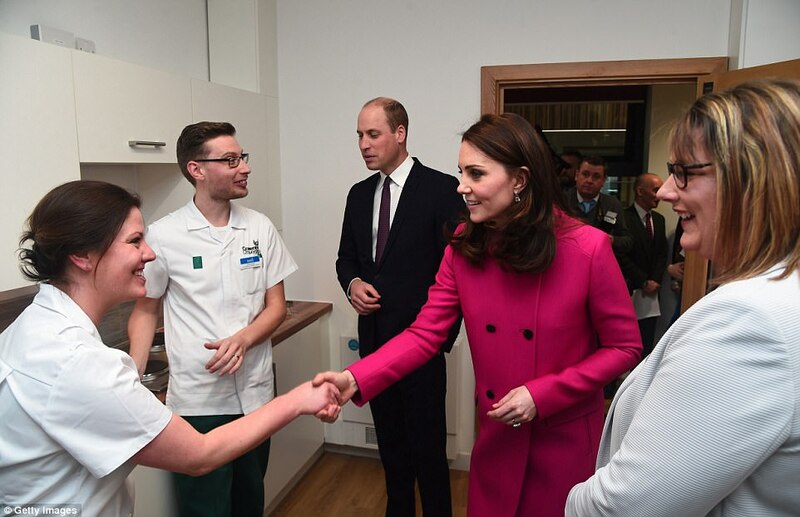 William and Kate also met students before following the journey of a fictional patient through the various areas of speciality taught at the centre, visiting a paramedic ambulance simulator, operating theatre, rehabilitation area and adapted living houses. 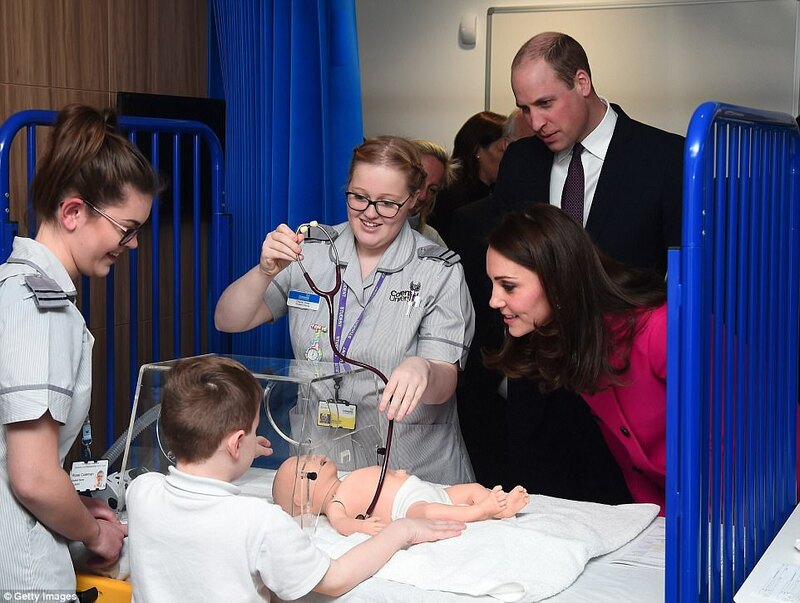 It's the only facility of its kind in the UK where students can learn to care for a patient at every stage of their medical experience through a simulation approach. 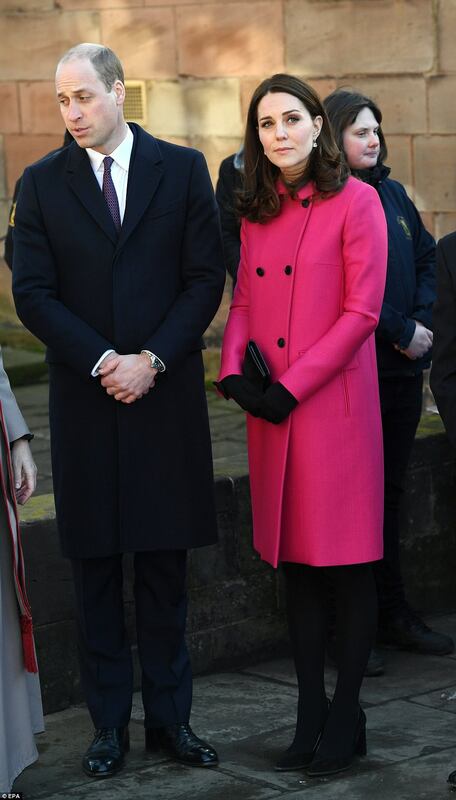 William and Kate will end their day by seeing first-hand the work of the organisation Positive Youth Foundation in the city. 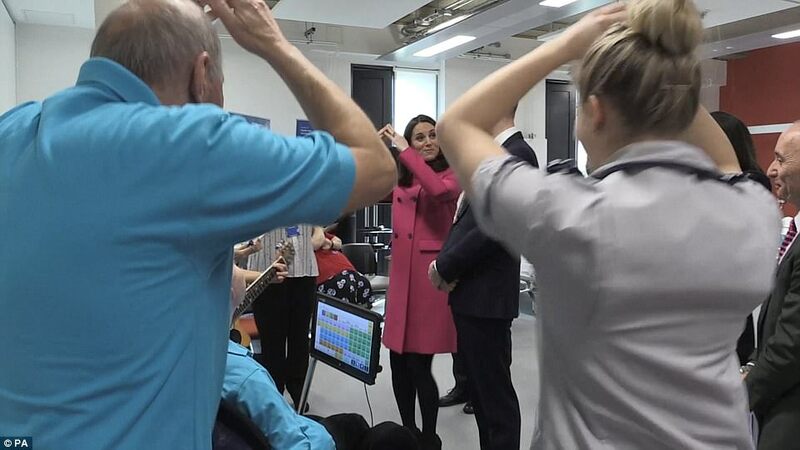 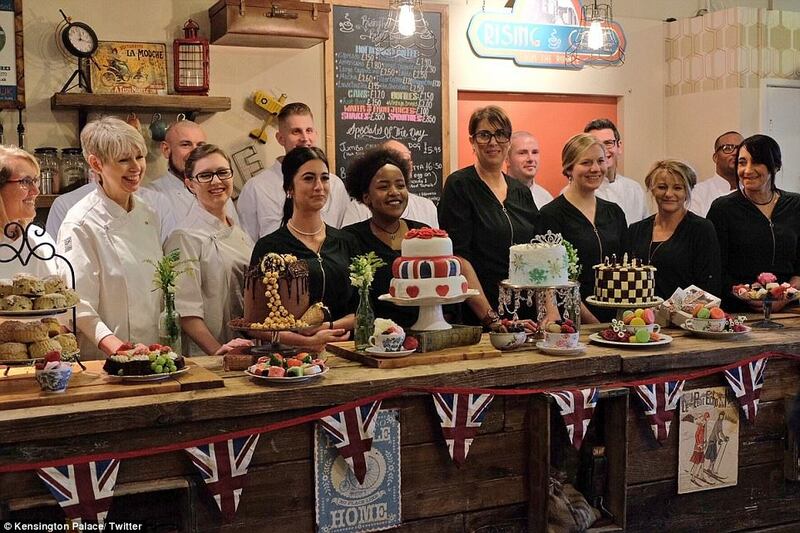 At a centre the royal couple will meet staff members, volunteers and young people supported by the service and watch music and boxing workshops.